You are currently browsing articles tagged Hurricane Katrina. At first I think Cap’n Kenny has a cold or something. As he poles the boat through the maze of canals near the gulf, he keeps hawking things up and spitting them into the cloudy brown water. It’s cold out. Cap’n Kenny is bundled in four or five layers of sweaters and jackets topped by a wrap that covers his face like a Bedouin crossing the Sahara. Cap’n Kenny makes this deep-throated murmur, hawks something up, spits. “You all right there?” I ask. “Me? I’m fine.” He spits again. And this time, because I’ve turned half-way round in the boat to face him, I see that what he is making all the fuss about is his chewing tobacco. A big gob of dark brown spit flies over the side of the boat, swirls for a moment on the surface, and then quickly sinks. Cap’n Kenny wipes his mouth with the back of his arm. Cap’n Kenny is a good ol’ boy. Before Katrina, he owned an auto repair shop. Afterwards, he decided he’d rather be out in the marshes and bayous fishing. 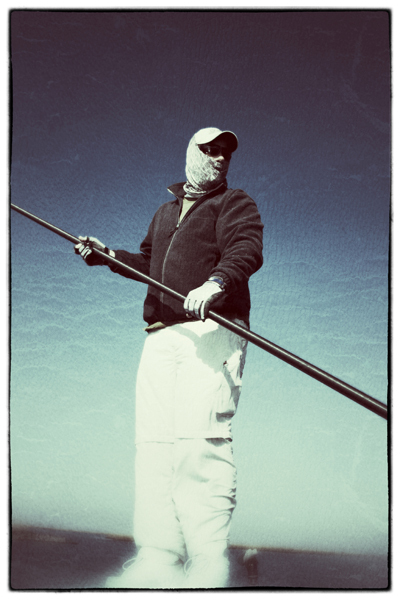 For $600 a day he’ll take two fools like us out fly-fishing for redfish, black drum, sheepfish—whatever. I ask him what he means. Cap’n Kenny reaches into a pocket on his jacket, pulls out a round tin of Skoal Wintergreen, takes a pinch and stuffs it behind his lower lip. I only wish he’d stuff the whole can of tobacco in there. Maybe it would help him keep his mouth shut. Cap’n Kenny, looking like a Cajun terrorist, out in the bayou. Photo by David Lansing.